My mother has made it quite clear that she wants to live at home until the very end. Any member of our family daring to even think ‘assisted living’ can expect a reaming on the scale of a super nova. Mom has no reason to transplant elsewhere. She has her recliner, her adjustable mattress, her crossword puzzles, and her memories in that house. After 53 years under the same roof there is no other place–that home is the center of her universe. Oddly enough her story somehow broaches the subject of why people do move—in this instance, the story of immigration to America. The 19th Century American humor magazine, Puck once declared that “Princes’ don’t immigrate,” and that truth has found a lot of support in our historic record. Just a glimpse of current film footage along southern European borders powerfully demonstrate this 19th century truism. The vulnerable from Syria and other destabilized regions of the Middle East grapple with hate, fear and barbed wire to carry their families to safety. Immigrants to American shores have all shared similar reasons to exchange the familiar, for the unknown. A brief look at America’s earliest settlers well illustrates this dynamic from 1620 to the present. Some folks were pushed, some were pulled, but all European newcomers set foot on Atlantic shores because there was no reason to remain in the familiar. Challenges to the Catholic Church provided the first steps toward the flow of populations to leave Great Britain. The Protestant Reformation essentially secularized the English Church, rejecting and replacing the Pope for the British sovereign as leader. Devout believers felt that King Henry’s English Reformation did not go far enough in ridding sacraments for deeper Biblical understanding. This faction became known as “Puritans,” those who wished to cleanse the English Church of all vestiges of Catholicism. The religious struggle in the British Isles was long and complicated, but ultimately resulted in systematic Puritan persecution. Two phases of believers departed Great Britain as a consequence. First, were the Separatists led by William Bradford, who believed England was damned beyond redemption. This group settled first in Holland, then acquired funding for a journey on the Mayflower to Massachusetts Bay. Americans remember these folks as the Pilgrims. Almost ten years later another group of mistreated reformers made landfall further north, closer to Boston. This wave of settlers, unlike the small trickle in Plymouth, came to Massachusetts Bay in a metaphoric deluge. 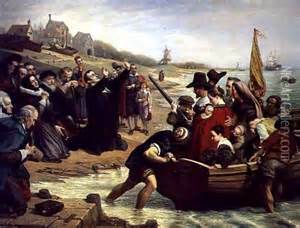 Thousands upon thousands of Puritans departed England, driven out by an intolerant, albeit re-Catholicized crown. Called the Great Puritan Migration, refugees from religious bullying settled from Cape Cod, to the Caribbean. The Quakers, or Society of Friends, made up another group pushed out of England. In a stratified culture of forced deference to one’s “betters,” this faith recognized the innate equality in all people. Quakers, for example, refused to swear oaths or ‘doft’ their hats in the presence of “gentlemen,” and that impudence made the sect an intolerable challenge to the status quo. William Penn (Jr.) became a believer in Ireland, and found this punitive treatment of Quakers unjust. However, as a wall to wall adherent to peace and brotherhood, Penn used his childhood connections to the aristocracy to depart to America. King Charles II granted Penn a large tract of land in the New World, where Penn and his followers settled in the 1660’s. “Penn’s Woods,” or Pennsylvania set up shop establishing the settlement upon the egalitarian principles of Quakerism. The father of President Andrew Jackson, Jackson Senior, stands as an excellent example representing another wave of humanity dispensable to the British Crown. Dubbed Scots-Irish, these were Scotsmen who resisted British hegemony and unification for . . ., for . . ., well forever. (Think of Mel Gibson in Braveheart.) First taking refuge in Ireland, this collection of rugged survivors, by the 1700’s, made their way to America. Not the most sociable bunch, these refugees found their path inland, eventually settling along the length of the Appalachian Mountains. Tough and single minded this group transitioned from exiles to backcountry folk. Now the settlers in Jamestown and Georgia offer a different explanation for permanent human migration. The London Company of Virginia, a corporation, funded an expedition to Jamestown in 1607. Soldier of Fortune, Captain John Smith and his compatriots crossed the Atlantic to get rich. Inspired by the example of Spanish finds in Mexico, these English mercenaries were hopeful of finding golden cities of their own. Almost a disastrous failure, the Jamestown colony survived, not by precious metals, but from cultivating a Native crop . . . tobacco. Eventually arrivals outnumbered departures in the stabilizing Virginia settlement, and the addictive crop paid handsome dividends for London investors. Georgia, the most southern colony came last, founded in 1732. The brain child of social reformer, James Oglethorpe, this colony of red clay became a dumping ground for victims of England’s byzantine criminal codes. Those of the lowest rungs of English society, from petty pickpockets to hardened felons found themselves “transported” to Oglethorpe’s colony for second chances, and out of the hair of English jailers. On a side note, slavery explicitly was forbidden in the Georgia charter. And that raises the issue of the last group forced to American shores; African slaves. These unfortunate souls did not want to leave their homes in West Africa. Much like my mother, this group did not wish a new life in a new land. Economic demands brought about this “Middle Passage,” the despicable trade in human cargo, kidnapped for the New World. Force, brutality, and exploitation wrenched these people from their lands to serve those who for contrasting reasons came to live in America. The injustice of this “African Diaspora” still plagues an American society grappling to resolve this age-old injustice. Caution ought to guide current politicians eager to vilify and frame immigration as an inherent evil and subverting occurrence. No one lightly pulls up roots. Leaving all that is familiar is an act of desperation, a painful and difficult human drama. Americans today view our 17th Century forebears as larger than life heroes, but their oppressors saw these same people as vermin–as dispensable troublemakers who threatened good social order. This human condition remains timeless, and loose talking politicians and opportunists must bear in mind the story of the nation they wish to lead. Oh, and my 84-year old mother just remodeled the house, keeping her Eden fresh and new. Gail Chumbley is the author of River of January, and the newly published River of January: Figure Eight. This entry was posted in African Diaspora, Andrew Jackson, Gail Chumbley, history, Immigration, Puritans, Quakers, Scots-Irish, Slavery and tagged Africa, Colonial America, Gail Chumbley, Immigration, river of january, slavery.